Hey guys I am uber excited for this week!!! You know how much I love themed weeks (and aparently so do you guys)! This themed week is extra fun and special. Extra fun because it is Kids Week here on Kitchen Concoctions. All week I will share kid friendly recipes, cooking tips, and ideas, it should be fun times had by all. And this themed week is extra special because it was an idea/request that came from my sister! So I am so happy she had the idea and I hope that she (and the rest of you) find this information useful! First up is an article I wrote a few weeks ago for meal planning/recipe site Food on the Table with tips for giving those school lunchs a bit more piazaz. 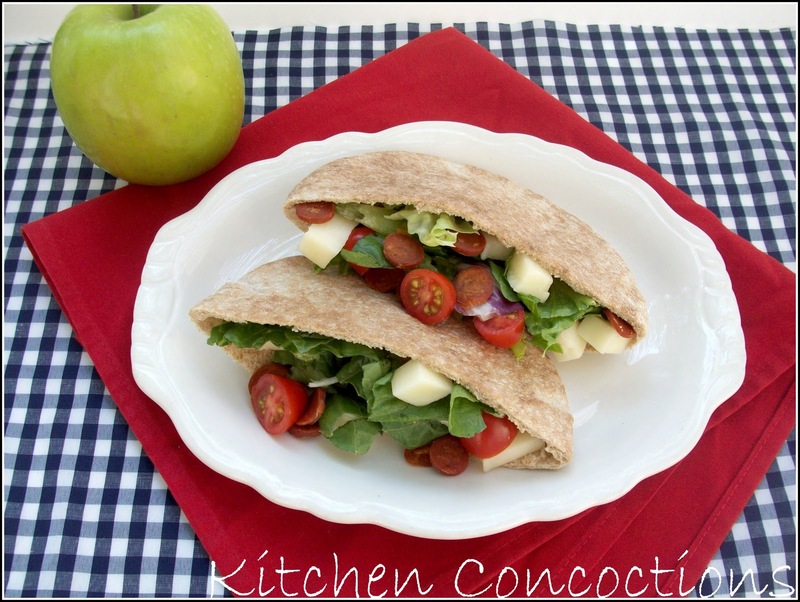 And my recipe for Pepporoni Pita Pockets are simple enough for kids to make and filling enough to be dinner on the run! Backpacks are packed with school supplies and new outfits are carefully folded; August is here and school is back in session. But even with all that preparation, have you given those school day lunches any thought? Many parents get stuck a lunch rut, packing the same thing every day for their child. However, here are some ideas for packing fun into their lunchboxes and ensuring your little one eats right. • Start with pretty packaging. At the beginning of the school year allow your child to pick out a lunchbox that represents them. Store food in colorful plastic containers or decorated zip-top baggies. Make sure your child’s lunchbox is well insulated to keep things cool or add freezer packs if needed. Reusable ice cubes are another fun touch to keep your child’s lunch cool or to save precious lunchbox space, use frozen grapes. • Get creative. Use large cookie cutters to cut those sandwiches into fun shapes. Smaller cookie cutters are great to cut sandwiches into bite sized pieces that can then be threaded onto a plastic skewer. Placing meat and cheese cubes on the end of a pretzel stick is another fun twist on serving food on a skewer. • Think outside the box. Stop serving your child’s favorite sandwich on bread, and next time use a tortilla, pita bread, crepe, bagel, crackers, or even hot dog bun. For a special treat, replace that regular sandwich with a peanut butter, marshmallow fluff and banana sandwich; chicken, tuna, or egg salad sandwich, or even cream cheese with jam and sliced fruit. Or skip the sandwich all together and go with pasta salad, hummus with veggie sticks, or a muffin/bagel with fruit and yogurt. • Make it hot. Packing soup, stew, or chili in a thermos with a side of cornbread or crackers is a great way to serve your child a ‘hot lunch’ from home. 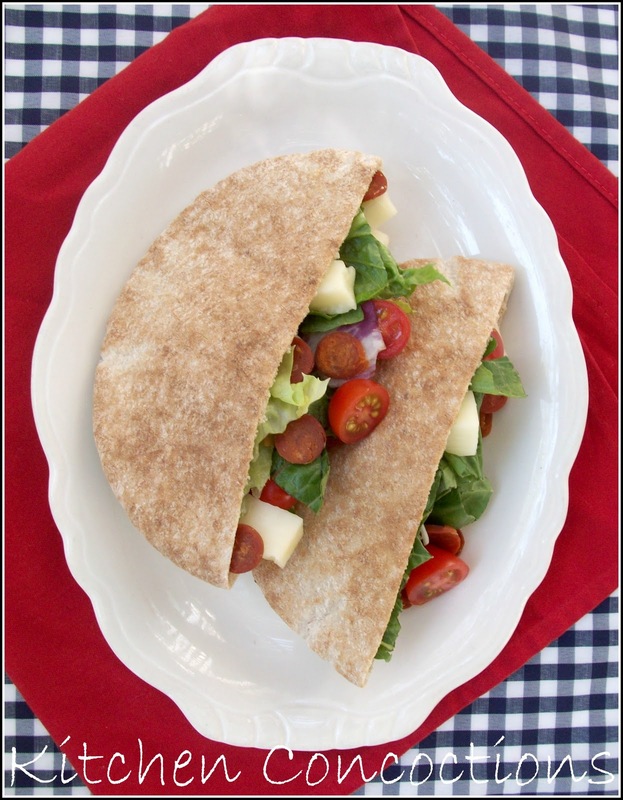 These Pepperoni Pita Pockets, paired with a side of fruit, make a perfect kid friendly lunch option or a quick dinner on a busy school night! Place desired amounts of salad greens, cheese, pepperoni, tomatoes, and salad dressing in a large bowl. Toss to evenly coat. Place salad mixture in pitas and serve. Note: If packing this in a sack lunch, dressing can be served on the side. I'm definitely in a lunch box rut! Thanks for the great ideas! These look so good! Thank you Heather!